← Scheduling Your Car Maintenance Has Never Been Easier! 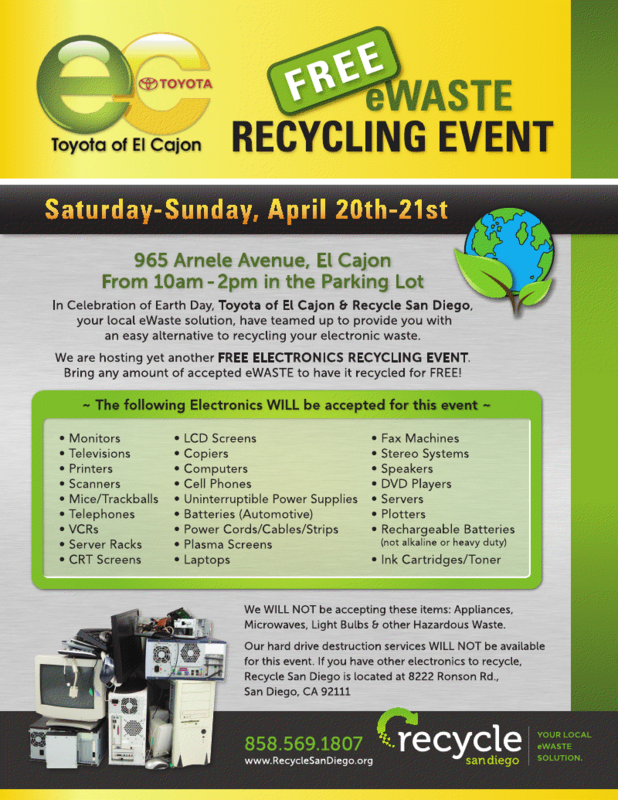 San Diego, CA – Recycle San Diego and Toyota of El Cajon have partnered to host a weekend-long eWaste Recycling Event in celebration of Earth Day. The event will run on Saturday and Sunday April 20-21 from 10am-2pm in the auto dealership’s parking lot at 965 Arnele Ave in El Cajon. Items that can be recycled at the eWaste recycling event include: computers, monitors, TVs, laptops, cables, printers, fax machines, scanners, DVD players, VCRs, and other electronic items. Recycle San Diego wishes to remind the public that it is illegal to dispose of e-Waste in the trash and California requires companies to recycle their e-Waste. California currently has the most comprehensive landfill ban in the nation, curbing both the illegal disposal and export of the largest category of toxic electronics which includes CRT TVs and computer monitors.